Nowadays, packaging is playing a key marketing role in develop shelf appeal, product information, establishing brand image and awareness. But what is the mean of packaging? Basically, packaging is the container for a product that encompassing the physical appearance of the container and including the design, color, shape, labeling and materials used. It is an extrinsic element of the product or an attribute that is related to the product but does not form part of the physical product itself. Packaging has several objectives such as Physical Protection is protection of the objects enclosed in the package from shock, vibration, compression, temperature, etc. Barrier Protection is a barrier from oxygen, water vapor, dust, etc. Several types of packaging are such as coldseal packaging, cohesive packaging, heal seal packaging, and many more. a. 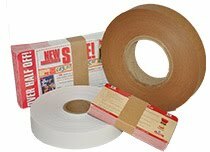 Cold seal packaging, is used to protect automotive parts, wrapping furniture legs, and packaging adhesive bandages. Cold seal packaging materials are from Medical grade sterilizable kraft paper from 21# to 60# basis weight, Bleached white kraft papers from 40# to 70# basis weight, and Natural brown kraft papers from 40# to 90# basis weight. Coating with Latex and latex free cold seals are available. 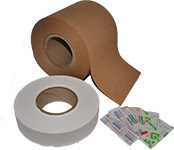 b. cohesive packaging, is used for banding such products as medical tubing, lap sponges, medical gauze, shop towels, industrial uniforms, envelopes, and printed literatur. Materials are from Medical grade sterilizable kraft paper from 40# to 60# basis weight, Bleached white kraft papers from 40# to 70# basis weight, Natural brown kraft papers from 40# to 90# basis weight and Tyvek® 1059B. Coating with Latex and latex free cold seals are available. c. heal seal packaging, is used ideally for all automatic heat seal banding machines. Popular brands include Akebono, ATS®, MBO (Palamides), and Band-All. Materials are from Bleached white kraft papers from 40# to 50#, Natural brown kraft papers from 40# to 50#. Coating is using Polyethylene heat-seal coatings designed for heat sealing or ultrasonic sealing. Shop Around in internet and try to find a local supplier which can save you a lot of time, cost and energy. Make sure you know exactly what you're looking for in size, shape etc and compare prices. Certainly don't be afraid to ask for a discount. Don’t forget to calculate the cost of the packaging and add it into the wholesale cost of your product or you won't make enough money to come out with a good profit. Labeling is another thing to take care with, creating your Brand what type of label, what color, what font so many things to consider. There is a lot to consider and decisions to make. Take your time, do your research and be disciplined with your budgeting. American Printpak, Inc, www.americanprintpak.com produces custom engineered flexible packaging material. They serve manufacturers and industries of medical-devices, medical tubing, healthcare, food, industrial packaging, and currency handling.